Unlike clothing that you can just throw in the washer when it gets stained, cleaning your mattress can be a bit more of a chore. However, whether you are just giving it a general cleaning or wanting to clean a specific stain, look no further than your kitchen cupboard. After flipping your mattress, you see an unknown stain. Maybe it is something your kids tried to hide or just something you forgot about. Whatever the case, baking soda is the way to go. Mix equal parts of salt, baking soda and water together in a bowl. 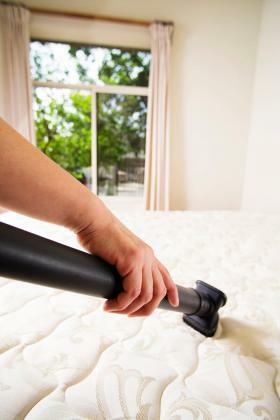 After you strip the mattress of all bedding, use the vacuum to clean all areas of the mattress, including the sides and bottom. Dab the microfiber cloth into the baking soda paste mixture. Gently dab and rub the area, lifting the stain. Allow the mixture to sit on the area for about 30 minutes. Using the vacuum, sweep up all the mixture. Repeat on the other side of mattress, if necessary. To provide general deodorizing and cleaning of large stains, you can sprinkle the entire mattress with baking soda and allow it to sit for 30 minutes prior to sweeping it up. If you know the stain you are dealing with, there are other do-it-yourself options to try. While the stain of cat pee can easily be removed, getting rid of the smell of cat urine is a challenge. Try this simple recipe containing 16 ounces peroxide, 1 tablespoon of baking soda (plus extra for sprinkling), and 1 teaspoon of Dawn dish soap. Use a paper towel to blot up the urine first, removing as much as you can. Sprinkle baking soda on the area and let it sit for 30 minutes to absorb the pee. Then vacuum or brush off the baking soda before adding the mixture. Mix a 16 ounce bottle of peroxide, a teaspoon of Dawn and a tablespoon of baking soda in a spray bottle. Generously coat the stain. Let it sit until dry. Vacuum up any residue left behind. There are several ways that you can remove dried blood, but this can be different from cleaning up fresh blood. To get rid of fresh blood, you can try a couple different methods. Spray white vinegar on the area and let it sit for about 20 minutes, then blot. Spray the area with a little hydrogen peroxide until the blood disappears. Dab up any excess. Sprinkle the area in baking soda and allow it to absorb the fresh blood. Vacuum the area thoroughly to remove. Dilute the area with a water and salt mixture (a teaspoon of salt and ½ cup water). Use an absorbent paper towel to blot the area then respray until stain is gone. Whether it was a glass of wine, your morning coffee, or a little spill from your late-night ice cream, getting those stains out can be done with Dawn detergent or vinegar. For food or drink stains that have set, mix 1 tablespoon of Dawn and 2 cups of water. Spray the area generously. Using a soft cloth, scrub the area until the stain is gone. For wine or coffee, you might want to take a different approach. After blotting the area with an absorbent paper towel to remove as much liquid as possible, soak the stain with distilled vinegar. Let it soak for 10 to 15 minutes and dab the stain. You may need to repeat this several times until the stain is gone. Let the mattress air dry. 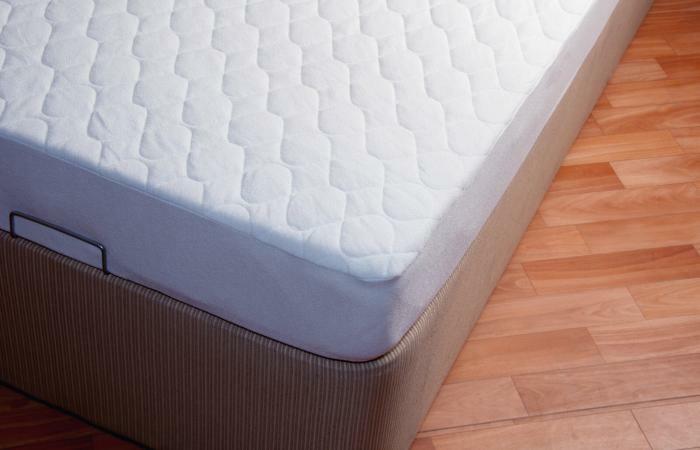 Removing vomit from a mattress comes in steps. You will need paper towels, white rags, 1/2 cup vinegar, 1 teaspoon of dish soap, and baking soda. Using a paper towel, remove any liquid or solids from the mattress. Soak a rag in water and blot the area generously to dilute the stain. In a spray bottle, mix 1 cup water, ½ cup of vinegar, and 1 teaspoon of dish soap. Using a clean towel or rag, gently scrub the area. Spray the area with straight water and dab the area. Repeat as necessary until the soap is removed. Sprinkle the area with baking soda to remove any lingering smells. Allow the baking soda to sit for several hours. Vacuum the baking soda off the mattress. Over time, mattresses just get dirty. Whether you are trying to clean up mystery stains or something specific, there are different techniques you can use with materials you typically have on hand.